Advice in relation to rent arrears has grown by over 40% since 2012, whilst debt-related issues have declined. This report examines the reasons why this steady increase in rent arrears has occurred, as well as who is most likely to be affected. It also looks at how CAB clients cope with being behind on the rent, and how they have managed to escape rent arrears – if they have indeed managed to do so. The considerable growth in rent arrears as an area of advice has coincided closely with changes to the social security system, particularly the advent of welfare reform. 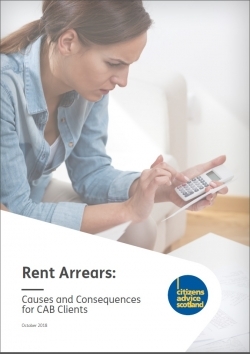 Almost one-quarter of those living in rented accommodation have experienced rent arrears in the past five years. CAB clients with rent arrears are more likely to be in part-time employment, unemployed, be a single person or lone parent, be aged 25-44 and live in 20% most deprived areas. The most common ways of getting out of rent arrears are borrowing money from elsewhere (such as from friends and family, or on a credit card) or cutting back on essentials. Neither of these are particularly sustainable solutions. During the past eighteen months, CAB clients’ rent arrears issues have predominantly been caused by them moving onto Universal Credit, and experiencing problems with the delivery of support to pay the rent through the new benefit. Evidence from Scotland’s CAB network and elsewhere indicates the incidence of rent arrears to be far higher amongst tenants receiving Universal Credit. Housing associations across the UK report that 73% of tenants on UC are in arrears, compared to 29% of others. Ensure tenants receive the best advice and support when faced with arrears or potential eviction.